Oh yes I can. And if you like brussels sprouts just okay, I can make you love them. When Sister and I were little (Little Brother came along later), Mama fed us all the delicious vegetables, but none of the yucky ones. Peas, broccoli, zucchini, carrots, corn, and squash were the stars of our dinner table stage. But beets, spinach, and the dreaded brussels sprouts — and any other veggie that has been universally panned by children everywhere — never even got a chance to audition. As a result, I never even tasted a brussels sprout until I was 20. And going against the seeming majority, I liked them. Now I get very excited when I see brussels sprouts on a restaurant menu, and I almost always order them. Especially if there is vinegar, panko, and/or bacon involved. 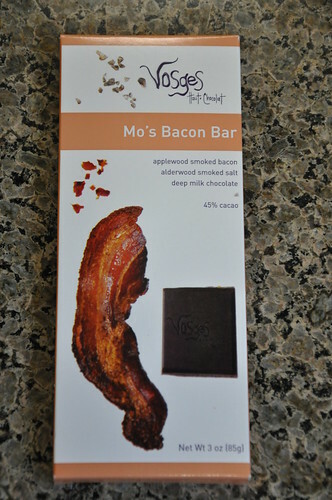 Bacon goes with everything, you know. And Mike bought us this chocolate bar to prove it. Back to the brussies. 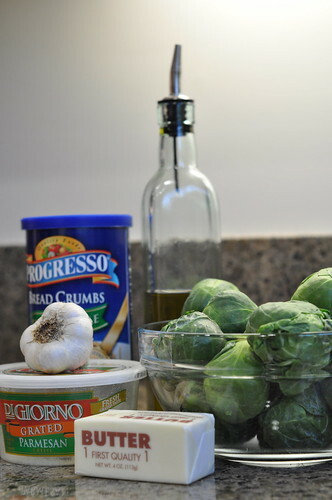 A few years ago I developed my own way of making brussels sprouts, and seriously, they are so delicious, I have made believers out of brussels sprout naysayers. 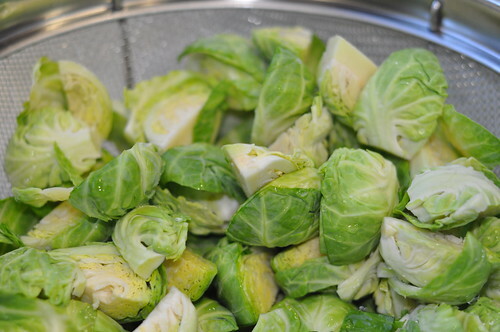 My grandfather isn’t a brussels sprout fan, but he likes these. 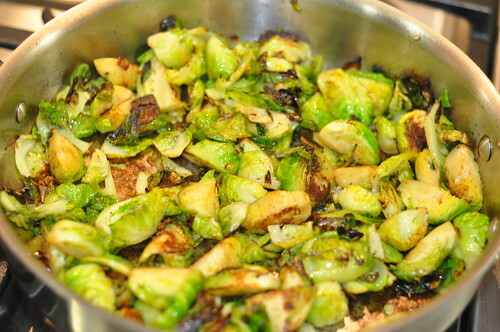 And my sister-in-law, Casey, is a lifelong archnemesis of brussels sprouts, but she once ate three servings of these. So while I might not have wrapped a taste bud around a brussels sprout till I was in college (seriously, I didn’t even know what they looked like), the kid that’s been swimming around in my stomach like a little goldfish is already getting a crash course. *If you can find the brussels sprouts still on the stalk – buy them!!! They’re super fresh and really good. Cut the stumpy nubs (I’m pretty sure that’s the culinary term) off the brussels sprouts and peel off the outer layer of leaves. Slice your sprouts in half, or into quarters if they are extra big (like mine were). Rinse and drain. 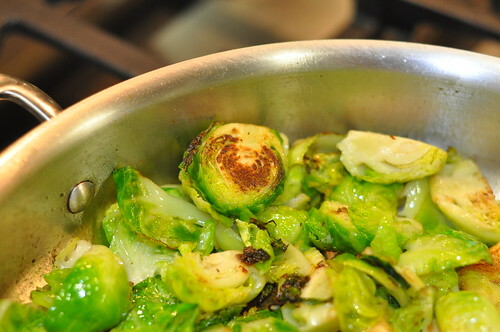 Get them pretty dry because excess water will cause popping when the brussels sprouts hit the hot oil, which can burn you. 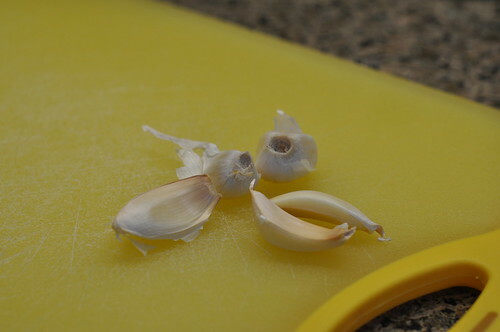 Meanwhile, coat a saute pan or skillet with olive oil, add several lightly smashed cloves of garlic, and warm over the lowest possible heat for about 10 minutes or until your entire house smells like garlic. You now have garlic-infused olive oil. 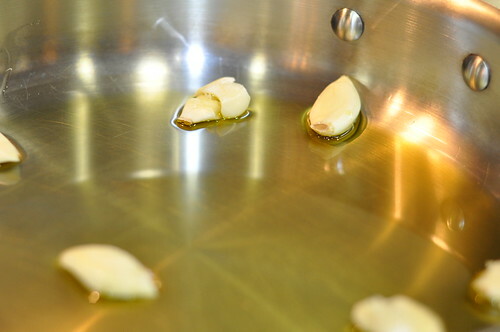 You can do this step in advance, then turn off the heat and just let the oil and garlic sit there until you are ready. It’s fine if the garlic browns, but don’t let it burn. It gets bitter, and you are what you eat. Fish out most of the garlic cloves — maybe leaving one or two of the largest cloves in the pan — then turn your heat up to high. 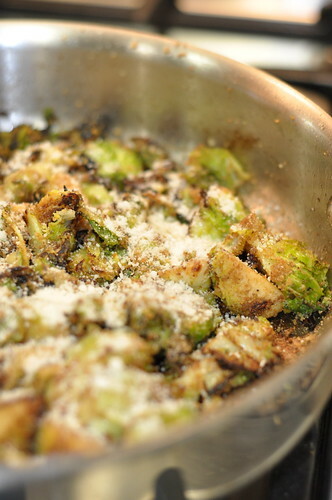 When the pan is hot, add about a tablespoon of butter, let it melt, then add your brussels sprouts. Salt & pepper to your liking. Don’t be afraid to let the brussies sit in the pan for a couple of minutes before you stir them around. You want them to brown up and caramelize a bit. 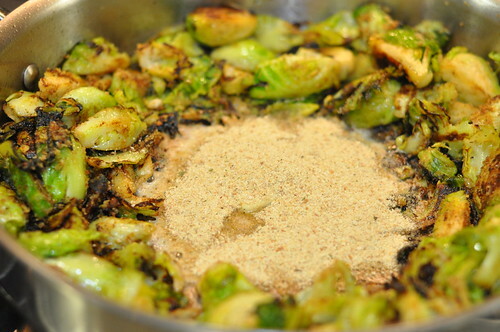 Brussels sprouts are naturally a bit bitter, and this caramelization takes some of that off. 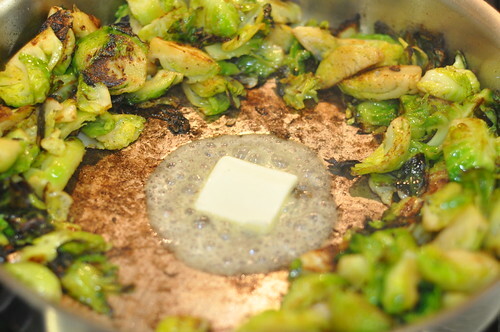 Stir, adding more butter or oil as your pan gets dry, and allow the sprouts to get nice and brown. It’s okay if some of the looser leaves burn a little — this makes the dish crispy and extra delicious! 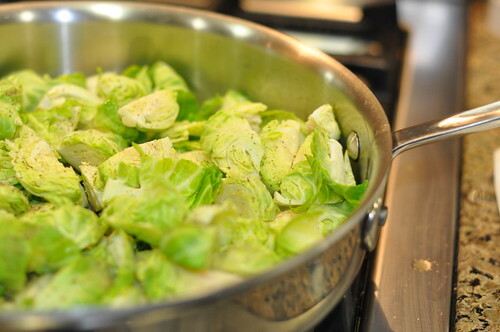 When the sprouts look nice and brown, push them to the sides of the pan, creating a hole in the middle. 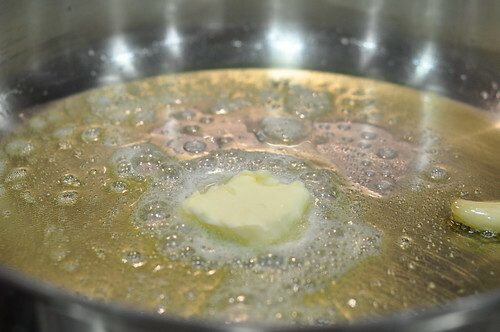 Throw another pat of butter into that, let it melt, and pour some bread crumbs over top. 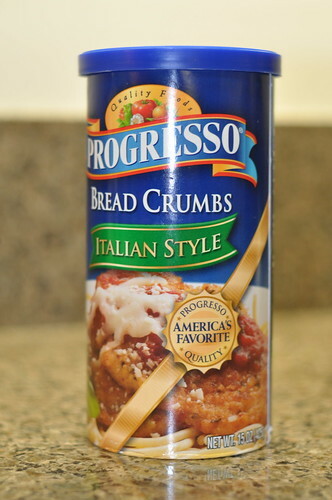 Use your stirring spoon or spatula to mix the bread crumbs into the melted butter, allowing the bread crumbs to toast a little bit. Then stir in thoroughly with your sprouts. You can repeat this step if you want more bread crumbs. 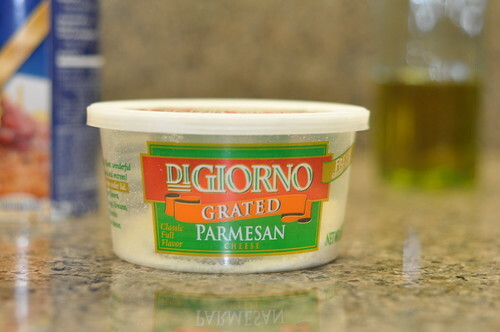 Remove from heat, then sprinkle with parmesan cheese. 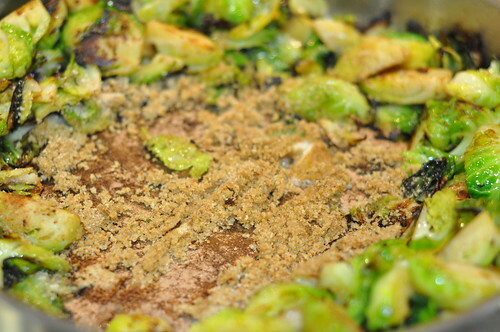 I already love brussel sprouts and am drooling over this recipe – thanks! Yes, it is true, archnemesis = brussels sprouts. 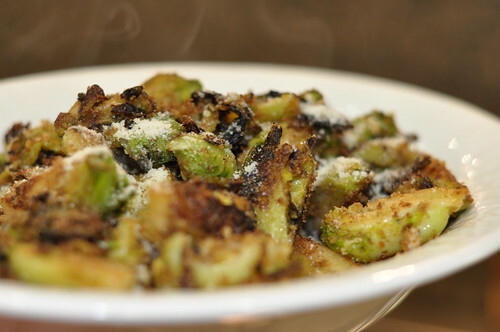 Brussels sprouts are the only veggie that I once spit in my napkin growing up and got caught, Hannah made these one night and I think her saying I ate 3 servings was a lie – I am sure I ate at least the whole bowl. They were spectacular!!!!!!!! Thanks Hannah for introducing me to many things :0) In case you are wondering what the first favorite thing is…Oatmeal Chocolate Chip Cookies – Hannah’s are the BEST EVER!!!!!!!!!!!!!!!!! 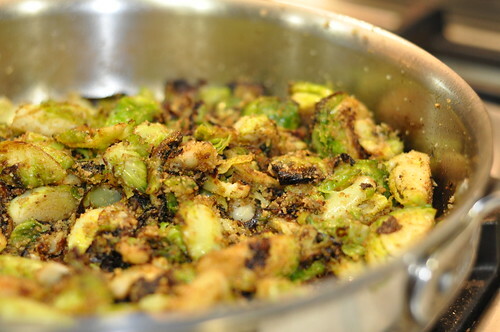 I love me some brussel sprouts…well people refer to my brussel sprouts as butter sprouts. 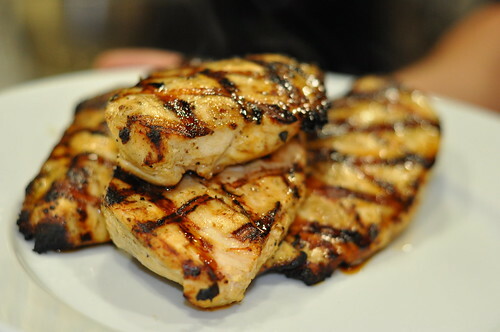 Butter, lemon juice, and Lawry’s seasoning salt do the trick for us…but I will definitely be trying this recipe. I boil mine a little too before saute to get them tender (although Sharkey likes his crispy so I end up doing half and half). Thanks Hannah! Point of personal privilege: Beets and spinach were occasionally on our dinner menu – but never brussel spouts. (And I continue to defend that decision!) Guess butter, garlic, and bacon can make anything taste good. Are they in season? I guess where you live, everything is always in season. Growing up I was the only one in the family that did not eat brussel sprouts or turnip greens. This recipe looks great. I guess, I will give it a try. Bonnie, you’re right… everything is always in season here. It’s kinda weird but it’s nice! Well I FINALLY got around to making these. And I have to say, they are FABULOUS! First time I’ve ever said that about a sprout, I can safely say. Your daughter is simply lovely; so happy for you and hubba. Enjoy every minute. Oh – and OUR song (from gramma) was “you are my sunshine”. Still sing it to them today.